Vance, a former marine and Yale Law School graduate, provides an account of growing up in a poor Rust Belt town that offers a broader, probing look at the struggles of America's white working class. The decline of this group, a demographic of our country that has been slowly disintegrating over forty years, has been reported on with growing frequency and alarm. J.D. Vance tells the true story of what a social, regional, and class decline feels like when you were born with it hung around your neck. The Vance family story begins hopefully in postwar America. J. D.'s grandparents were "dirt poor and in love," and moved north from Kentucky's Appalachia region to Ohio in the hopes of escaping the dreadful poverty around them. They raised a middle-class family, and eventually their grandchild (the author) would graduate from Yale Law School, a conventional marker of their success in achieving generational upward mobility. But as the family saga of Hillbilly Elegy plays out, we learn that this is only the short, superficial version. 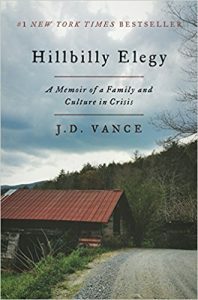 Vance's grandparents, aunt, uncle, sister, and, most of all, his mother, struggled profoundly with the demands of their new middle-class life, and were never able to fully escape the legacy of abuse, alcoholism, poverty, and trauma so characteristic of their part of America. Check out these similar titles to Vance's epic biography. The deceptively powerful stories in Null's first collection, after his debut novel Honey from the Lion, create a map not only of the geography of rural West Virginia but also of its people. These are characters inhabiting places largely ignored by the outside world. In "Mates," a man kills an endangered bald eagle on his land, believing himself to be above the law, and is then stalked and tormented by the eagle's mate. In the astonishing "Telemetry," a young scientist's camp on Back Allegheny Mountain is visited by a local man and his daughter, their presence forcing the scientist to confront her relationship to her own origins, which becomes a recurring theme in this short story collection. Queenan's deeply funny and affecting memoir about his great escape from a childhood of poverty in a Philadelphia housing project in the early 1960s. Linda Tirado, in her signature brutally honest yet personable voice, takes all of these preconceived notions and smashes them to bits. She articulates not only what it is to be working poor in America (yes, you can be poor and live in a house and have a job, even two), but what poverty is truly like-on all levels. In her thought-provoking voice, Tirado discusses how she went from lower-middle class, to sometimes middle class, to poor and everything in between, and in doing so reveals why "poor people don't always behave the way middle-class America thinks they should. Renowned sociologist Arlie Hochschild embarks on a thought-provoking journey from her liberal hometown of Berkeley, California, deep into Louisiana bayou country - a stronghold of the conservative right. View more suggestions for Hillbilly Elegy.